A Los Angeles High School athletic phenom from 1939 to 1941, Alan Hoisch played varsity football as a Stanford freshman in 1942, and at UCLA in 1946 and 1947, following service in the U.S. Air Corps (the only Jewish first pilot and first lieutenant in his C-46 squadron). Hoisch was star halfback on the 1946 undefeated Bruins (10-0) Pacific Conference champions. Against Illinois in the 1947 Rose Bowl, he ran back a kickoff 103-yards, and set up a second touchdown in the Illini 45-14 route of the Bruins. His TD kickoff return is the longest run in Rose Bowl history. 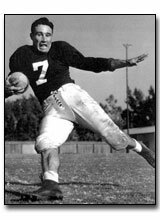 In 1947, Hoisch was named to the AP All-Pacific Coast team (the only Bruin back elected that year) , was Honorable Mention All-America, and voted to the USC All-Opponent team. Al was denied a senior year on the UCLA gridiron by the Pacific Coast Conference because of his freshman season at Stanford--even though other WWII veterans in similar situations were granted permission. As a youngster, Alan’s middle-school sport achievements got him elected to the John Burroughs Athletic Hall of Fame. During the 1939-41 period, he was named an All-Western, All-City and All-Southern California football running back. In track and field, Alan ran the 100-yard dash in 9.8, the 220 in 21.6, and broadjumped 24-feet!